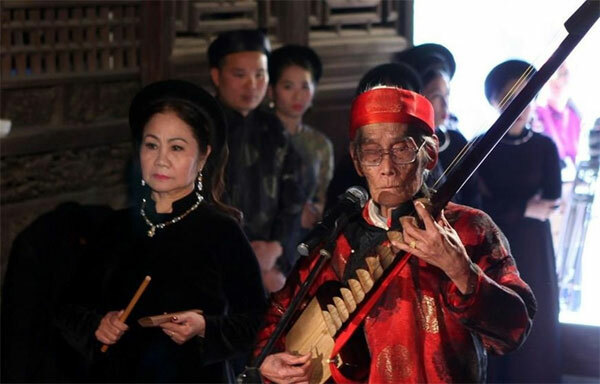 VietNamNet Bridge – One of the country’s last ca trù (ceremonial singing) masters, Nguyen Phu De, died at the age of 97 on Friday. He was of 62 individuals given the title of People’s Artisan, the State honour for artisans with significant devotion to national cultural heritage, just last week. De not only taught ca tru to younger generations but also helped open clubs to keep the traditional art form alive. The veteran instrumentalist, along with other artists and researchers, played a part in preparing the dossier on ca tru submitted to UNESCO for recognition in 2008. In recent years, he also helped researchers create a musical note archive for ca tru, which has been passed down orally for centuries. De was born into a family of artists in Hai Duong Province. His father was a renowned instrumentalist while his mother was a famous ca tru singer. He was the sixth generation in his family to pursue ca tru. He learned to play dan day (three-stringed plucked lute) from his father and grandfather. De earned a living with his talent by the age of 12, performing widely in Hai Duong, Hanoi, Hai Phong and Thai Binh. According to UNESCO, ca tru is known as a “complex form of sung poetry”. A performance often features a female singer who “uses breathing techniques and vibrato to create unique ornamented sound” and two instrumentalists who “produce the deep tone of a three-stringed lute and the strong sounds of a drum”. The form of singing, believed to date back more than 1,000 years to the Ly Dynasty, was recognised as an “intangible cultural heritage” in need of preservation by UNESCO in 2009. It was performed at rituals, feasts, in village communal houses or at singing contests. Nowadays, locals and tourists can enjoy performances in theatres and cultural relic sites in the Old Quarter of Hanoi. Ca tru is on the verge of being lost due to the shrinking number of practitioners and the advanced ages of the few remaining master singers and musicians.